One of my 12-year-old sons (I have twins) had wanted a guitar for the past few years. So, when the opportunity came to build one from a kit, I took it. The day that the box from Musicmaker's Kits showed up in my office, my first impression was "Man, look at all these strange-looking parts. What did I get myself into?" But what I found was 11 nicely machined wood parts (six of which needed no further shaping), all the hardware, including a set of steel strings, and the most complete illustrated instruction booklet I have ever read. One of the first things I encounterd in the booklet was a box titled BEFORE YOU BEGIN. It suggested that I read through the entire booklet before beginning. Good advice! Following it familiarized me with building the instrument and helped dispel any misgivings about successfully completing the project. Because the process of building the guitar is a series of small steps separated by waiting for glue to dry, it's perfectly suited to the weekend/evening woodworker. 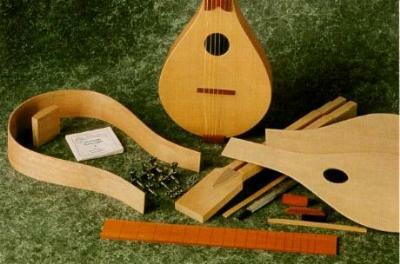 Many of the operations, such as gluing the sides and back to their braces, installing and trimming the soundboard, and gluing in the fretboard, take half an hour. But shaping the neck and peghead, fitting the binding, and installing the fret wires and dots took me up to two hours each. In all, I spent about 10 hours unpacking the kit, reading the instructions, and constructing the guitar. That time didn't include the finishing. There, I got a little carried away. The guitar offered the perfect opportunity to try a highly polished lacquer finish. So after two good coats of gloss Deft, I wet-sanded the guitar with 400-grit sandpaper. Then I applied three more coats of Deft followed by wet-sanding with 600-grit sandpaper. Next, I shifted to a progression of wet-sanding with 1,500-, 2,400-, 3,600-, and 6,000-grit Micro-Mesh. A final polish with Watco Finishing Wax really made it shine. And for a small instrument, it has a buoyant sound. There are a couple of features associated with this kit that I really like. One is the availability of some worthwhile options, such as decorative binding for the body, mother-of-pearl for the fretboad, and a choice of laser-cut rosettes for the soundhole. The other is the opportunity to customize the top profile of the peghead and the bottom end of the fretboard. I did, and now I know that my guitar is one of a kind.